If you know us, you know that we spend more time planning our Disney vacations than we actually do on the vacations themselves. Talking about where we’ll go and what we’ll do months before we get there is half the fun of going to Walt Disney World. We get the girls in on it, too, asking them about which rides they want to ride, where they want to eat, which characters are on their must-meet lists, and (I have to confess) singing the parade songs with them. When Ana, on her own and totally unprompted, began belting out, “Celebrate the dream inside of yooooou — the dream that just came truuuuuueee! CELEBRAAAAAATE!,” I knew we had reached a new level of Disney fanaticism. The only downside to planning a Disney vacation with young children is that they can’t read through all of the wonderful travel books that are out there. 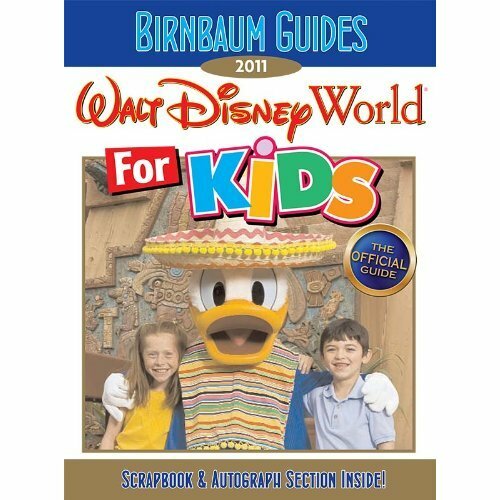 That’s why I was very excited to find out that Birnbaum, the official Disney travel guide, puts out a book called Walt Disney World for Kids that is written by kids, for kids. Each park and each ride is represented with pictures, a short description, and a quote from a young visitor on how they enjoyed it. Each ride comes with special illustrated ratings — loud, scary, wet, dark, rough — that even a non-reading child can recognize and understand. There’s a section on hotels (again, complete with big, colorful photos) and even lists of all WDW restaurants and what types of kid-friendly food they serve. The guide also comes with a countdown page, a section for recording memories, and pages for autographs once you’re in the park meeting characters. We pre-ordered a copy of the 2011 edition for our girls, and it arrived in the mail about a week ago. Already, it is looking worn and loved, as both Ana and Emma have spent hours (literally!) flipping through it and talking (in super loud voices!) about what they’re going to do at Walt Disney World. So fun! If you’re going to see “the World” with children of any age, this will be a helpful tool in introducing them to the parks and getting them ready for their trip. Happy planning!